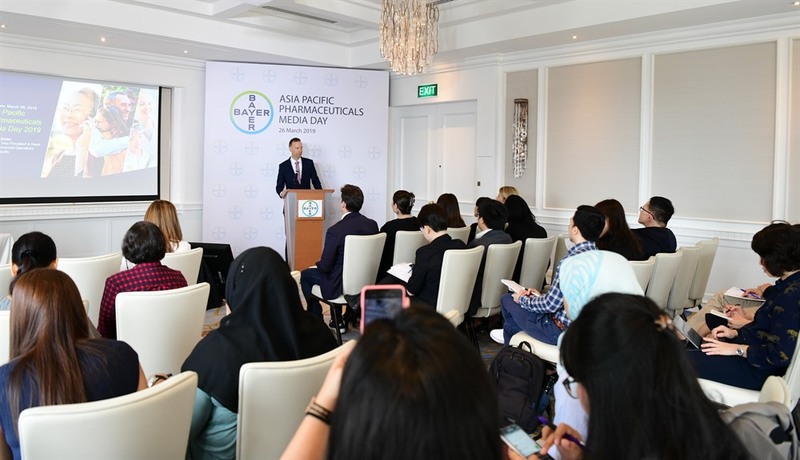 SINGAPORE — There is a strong demand for Bayer’s innovative medicines in Asia Pacific which has driven the growth of its pharmaceutical business in the region, Claus Zieler, senior vice president and head of commercial operations, Bayer Pharmaceuticals Division Asia Pacific, said. In 2018 the company’s key products like oral anticoagulant medicines, eye medicines and oral cancer drugs continued to be well received by doctors and patients in the Asia Pacific, he said. Bayer reported that as of 2018 nearly 48 million packs had been delivered to patients in the Asia Pacific for blood clot prevention and treatment for several indications across the venous and arterial thromboembolic (VAT) space and about 3.5 million doses have been administered to patients in the region for treatment of retinal disorders including wet age-related macular degeneration and diabetic macular. Nearly 1.4 million packs were delivered to patients in the region for treatment of late-stage liver cancer, advanced kidney cancer and differentiated thyroid cancer from 2010 to 2018. Year 2018 was another one of robust growth, the company said, revealing that the region’s sales grew 7.3 per cent to over 5.2 billion euros (US$5.6 billion), marking the eighth consecutive year of growth for its pharmaceuticals sales in the region. The region contributed more than 30 per cent to the division’s global sales and continued to be the fastest growing reporting region for Bayer’s pharmaceutical business. The company’s pharmaceutical business was again ranked one of the fastest growing amongst top multinational pharmaceutical companies in the Asia Pacific in 2018 by global health intelligence agency IQVIA. This year the company targets global pharmaceuticals sales growth of around 4 per cent. The outlook for the Asia Pacific region remains positive, with IQVIA projecting an average growth rate of 3.6 per cent for the pharmaceutical markets in the region from 2019 to 2022. In 2018 Bayer invested around 3 billion euros ($3.4 billion) in research and development of new drugs globally. Its pharmaceuticals pipeline is well stocked, the company announced, with about 50 development projects. Of them, many might have the potential to treat various types of cancers, diabetic kidney disease, and chronic heart failure which represent areas of high medical needs for the region’s ageing populations. The Asia Pacific is strongly represented in the company’s clinical development activities and real-world studies. In 2018 there were 54 ongoing clinical trials and 69 real-world studies in the region. Of them, 22 of the former and four of the latter are in Singapore, the company said. The company has continued to expand its collaboration activities in the region. These range from strategic research alliances with the medical and scientific communities to open innovation platforms involving entrepreneurs, start-ups and the wider public. Recently Bayer, in partnership with NUS Enterprise, the entrepreneurial arm of the National University of Singapore, announced the Healthy Hearts, Healthy Aging initiative to drive adoption of innovation in cardiovascular diseases prevention in Asia Pacific. This initiative, among others, is aimed at bringing together healthcare experts, policy makers, innovators, academia, non-governmental organizations, and corporations to examine the role of health innovations in preventing serious cardiovascular events such as strokes and heart attacks in seniors living with cardiovascular diseases.